THANK YOU EVERYONE FOR ANOTHER SUCCESSFUL EVENT! Grand door prize winner Chris Lowe,VA7XZZ, with son in hand, receives ID-4100A radio from Paul Veel, VE7PVL, Icom Canada Amateur Sales Manager. Ed Frazer, VE7EF was the lucky winner of a $100 Gift Certificate from Radiowrold Central, proudly holding the certificate behind event announce and RARC member, Peter Walsh, VE7XPW. Winner of 50/50 raffle Chris Lowe, VA7XZZ receives $107 (half of ticket sales) from RARC treasurer Allan Leong, VE7XPW while RARC vice-president and event announcer Peter Walsh, VE7XPW looks on with pleasure (and also amazement). It is unusual to see a winner of both the 50/50 raffle and grand prize of the same event - most definitely someone beating all the odds in a game of chance! 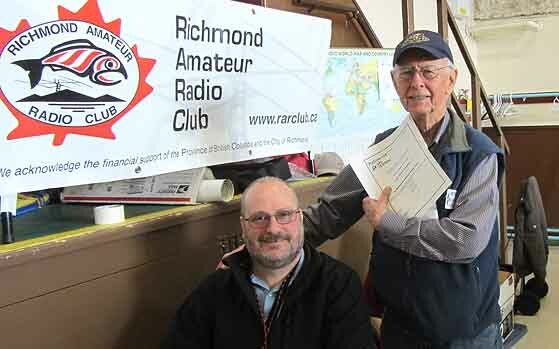 Richmond Amateur Radio Club (RARC) will be hosting its third annual swap meet and emergency communications display event on Saturday, April 6, 2019, once again in the South Arm United Church gym building on 11051 No. 3 Rd. (southwest corner of No. 3 Rd. and Steveston Hwy.) in Richmond, BC. There will be the usual vendor tables, door prizes from local and national suppliers, and special raffles (licence pending), as well as a more extensive display of communication equipment by Amateur radio organizations and municipal emergency programs.